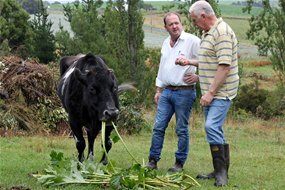 Did you know the world’s oldest cow lives in Australia? Yesterday, Molly B’s good samaritan rescuer stopped by this blog and kindly provided an update on Molly. If you’d like to read how Molly is doing, go to the Comments section of Today’s cow is Unsinkable Molly B – a cow with more lives than a cat! post. And just like Molly B, Nellie was rescued from the slaughterhouse many years ago. Another happy, moooving ending! – I saw a dairy truck in front of a small grocery store as I was driving, by but didn’t manage to snap a photo of it (after all, I was driving). – I saw several cows at breakfast time when my son flipped through a book on children’s songs that features more cows than you could ever imagine, even when there’s no mention of cows in most of the songs. 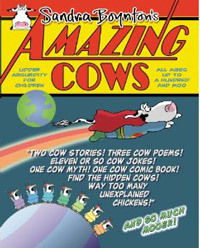 Next Post Which children’s book shows the most cows? I saw a cows tenderloin roast on my plate for lunch. It was delicious. Are you familar with Temple Grandin? She is the autistic woman featured in last years HBO movie, and Oliver Sacks (whom the movie “Awakenings” is about, starring Robert DeNiro) wrote about her in his book “An Anthropologist on Mars”. 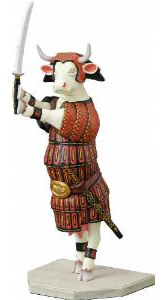 She is cow-obsessed, has a PhD in animal sciences, lives in Colorado,and designs cattle shoots and slaughter houses. Just thought to mention it here. Thanks for mentioning Temple Grandin. I’m familiar with the HBO movie but haven’t seen it yet. It will be interesting to see if I get to run into her / her story this year, rather than making it happen purposely.